NOTE: It’s best practice to adapt your code to what your theme is already doing, copy their “code style”. The first thing we are going to do is take a look at what our theme is doing, we can then begin our planing. Most themes should have a file called page.php, if you don’t have this file in your theme, you can look at index.php. 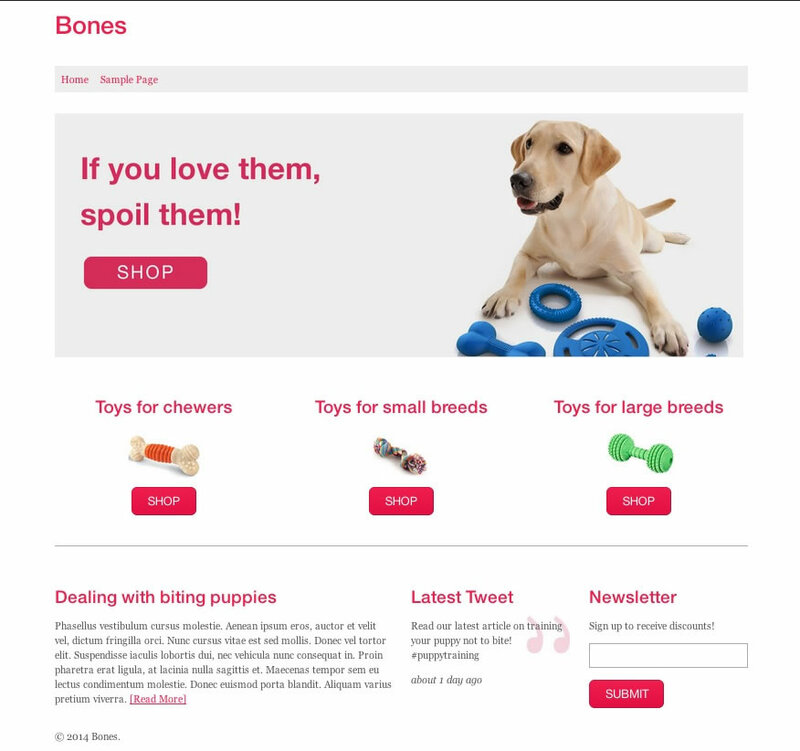 In this example, we have been using the Bones Starter Theme. Below is the code for the page.php file in the Bones theme. After taking a look at the code from page.php, I also explored the CSS and a couple of other theme files to gather information. Responsive columns* add up to 12 (the #main div has a class of .eightcol, if you open sidebar.php, that <div> has a class of .fourcol, 8 + 4 = 12) and the first and last columns have a class of .first and .last respectively. The theme is using HTML5 markup, but it’s also using <article> tags, author information and post time/meta data. Since we are creating a home page, I will remove these. The theme does have CSS for buttons and headings already setup, but we may have to add a bit of additional CSS. 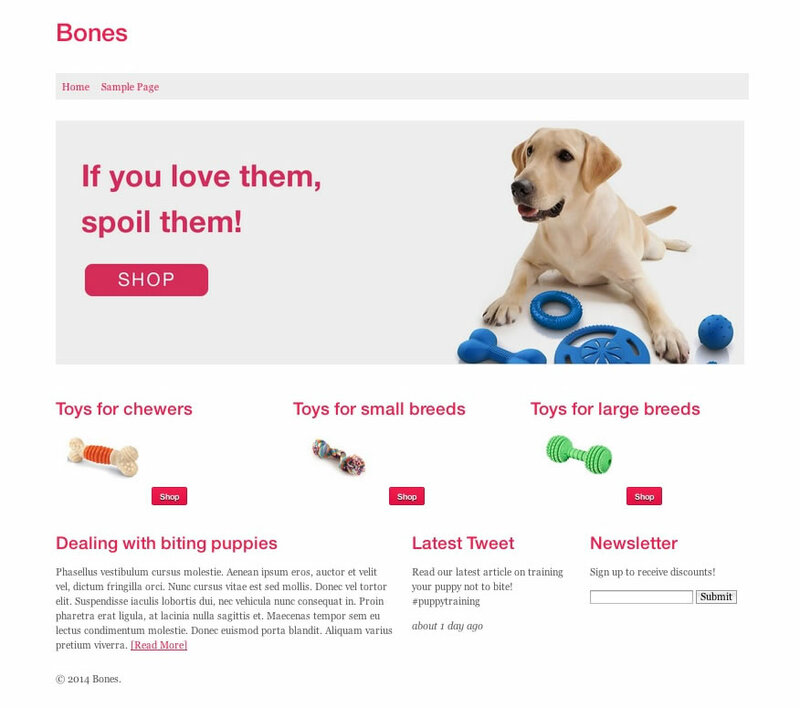 *These responsive columns (.onecol, .twocol, .threecol etc. with lasses of .first and .last) are part of the grid that is built into the Bones theme, most likely these won’t do anything in your theme. If you have a theme that is responsive, you need to look into what framework they are using in order to add the right classes. Now that we have a solid plan, let’s code this out. First things first, make a copy of your page.php (or index.php if that’s the file you’ve been consulting). You can name this whatever you want, but I typically name my custom templates like this so they are easy to find: template-something.php, so in this case template-home.php. From now on, this is the file we will make changes to…leave page.php the way you found it. Make sure you keep this new file in the same directory as page.php so that WordPress can find it. I’m going to start by removing all of the <article>, <header> and <footer> tags and their contents — these don’t make sense for our home page since there are no posts being displayed. I’m am NOT going to remove the <section> tags within <article>, we will use this. I’m removing itemprop="articleBody" from <section> because again, this is not a blog post. I am also removing <?php comments_template(); ?>, again this doesn’t fit on our home page, we don’t need to see comments. In addition, I’m removing <?php get_sidebar(); ?>. We are not using a sidebar in our mockup, so we don’t want to call one. We need to change the .eightcol class on the #main <div> to .twelvecol since we removed the sidebar and need this to be a full width column. Three .fourcol columns in <section> one. One .sixcol and two .threecol columns in <section> two. Now that we have all of our code in place, let’s throw in our dummy content. We will include any additional markup we need to get our page looking like our mockup. In the next tutorial, we will hook this up to WordPress so we can grab content from the admin, but for now our content will be static. NOTE: I want to note that this step is not necessary and is not a part of my normal process. I’m adding this step so you can have some hands on experience and better understand what will be happening in Part 3 of this tutorial. I sliced and exported the images from the mockup including the “slide” from the top of the page. I saved these in the image folder of the Bones theme. I’m using get_template_directory_uri(); to grab the URL for the theme’s directory and then adding the rest of the file paths for the images. Other than that, you can see I’ve only used basic HTML to add the content we had laid out previously. Note that I also used the class of .button on a few elements. From the exploration we did earlier, I learned that our theme already had a class for this. This is pretty close! Since we stuck with a design that flowed from our original theme, we don’t have a whole lot of work to do. These are the basic steps to integrating your design into a custom WordPress page template. 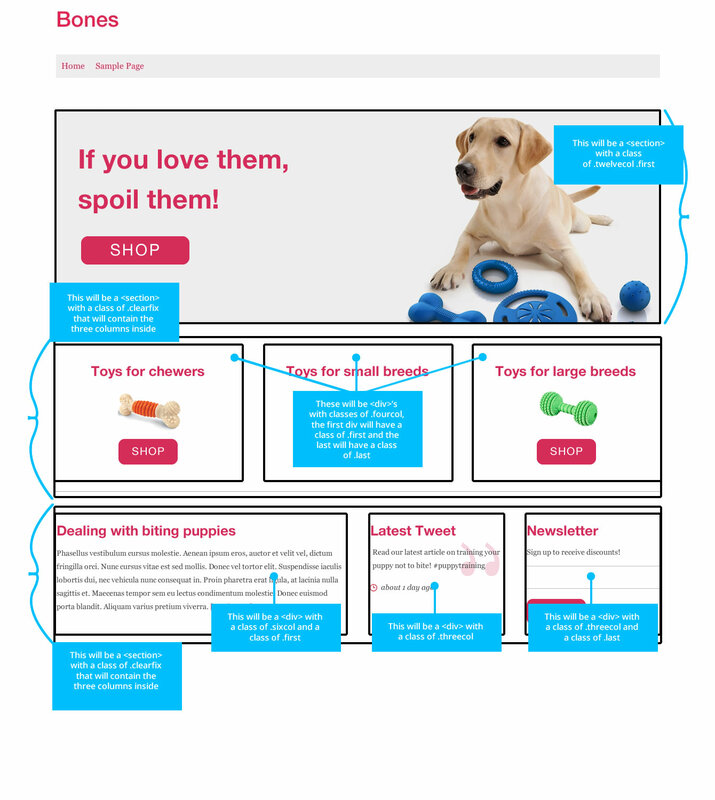 Even though our content is static, we still have a custom layout that we designed ourselves. Part three to this tutorial series will be coming soon. I will be covering the process of creating custom fields for the page template so that our content can come directly from WordPress! Designing a custom WP is easy but your post has made it look super easy. Appreciate your efforts in writing this post to spread knowledge. Thanks Jamil, I agree! I think people tend to overthink it, or just don’t know where to begin ;) I still intend to finish this three part series …two years later haha. Really looking forward to Part III . When do you think you would release it? This is priceless! So nice of you to share this, I will tell everyone about this! hehe. You’re welcome! I’ll post here when part 3 is finished. This is a really nice and easy tutorial to follow!